The intelligence of dolphins is one of their most outstanding features. Among the thousands of members that the animal kingdom has, dolphins take one of the top places regarding intelligence. The brain is the organ involved in the ability of understanding, reasoning, learning, and other cognitive processes. The dolphin’s brain is astonishingly complex, almost comparable to that of humans. And it is large related to their body. Through magnetic resonance imaging, their brains have been found to be 4-5 times bigger than those of other animals of similar sizes. 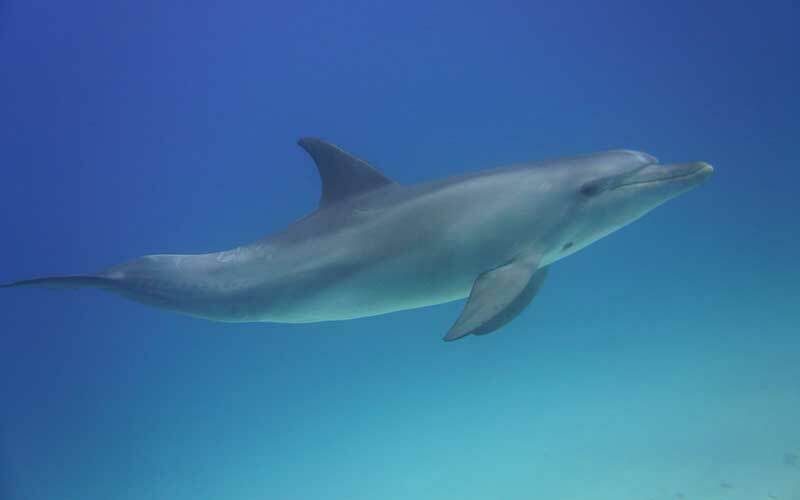 The bottlenose dolphin (Tursiops truncatus) is the second place in a list of species with a higher encephalization ratio (EQ), which compares the mass of the encephalon against its body size. In addition to a developed neocortex, the cerebellum has more convolutions (turns of the brain surface) than that of other mammals. The connections between the neurological areas and the motor areas of the organ exhibit a great sensitivity to pain and a pronounced tendency to stress. Some scientists claim that the social intelligence of these cetaceans competes with that of the great apes. – Their forms of communication are complex, evolving and diverse. – They are creative and playful animals. Their behavior is not mechanical or rigid; they seem to enjoy playing and look for the companionship of other individuals. – Their empathy suggests that they experience emotions such as sadness or joy. – They have an excellent learning ability; this is why they are highly requested animals for water parks, although the activities of these places are highly controversial. – They can transmit learning to other generations of dolphins. There have been cases where they use tools. For example, sponges to protect your snout from rough surfaces. – The members of a pod collaborate with each other and sometimes with other species of animals. Some scientists argue that the social intelligence of these cetaceans competes with that of the great apes because they can demonstrate empathy towards the companions and help them when they are injured or immobilized. Signs of higher intelligence are related to self-awareness and dolphins are. Proof of this is that when they look in a mirror, they can recognize themselves and know that they are the ones in the mirror; This is a sign of the development of abstract thinking. Likewise, their learning ability is comparable to that of a 3-year-old child, according to cognitive psychologist Diana Reiss of the New York City University. + According to science, their ability to learn is comparable to that of a 3-year-old toddler. – They respond positively to television, that is, show interest and curious attention to the moving images displayed on the device. – They have been seen playing with inanimate objects that they find in their surroundings. – They play with bubbles of water as they swim, and then take the time to observe their creations. – They can solve complex problems and can imitate the actions of human beings. A dolphin named Tanner was blindfolded and told to imitate the actions of a trainer who was in the water. As the dolphin could not watch, emitted sounds and interpreted the sound waves to make replicas of the movements of the instructor. The differences between human intelligence and that of dolphins are that the former need to manipulate their environment, but dolphins do not, and that is why they concentrate their intellect in other things. There are still many questions regarding dolphin intelligence. There are still many things to discover, but what is known so far is enough to say that these animals are very, very intelligent. Most scientists refuse to take a firm stand on the intelligence level of dolphins, and although many will admit that dolphins seem to be intelligent creatures, it is not a proven fact. The biggest problem researchers are running into seems to be the actual definition of intelligence and the way to test it in animals. If you were to step out into the street and ask the first ten people you see whether or not they believed dolphins were creatures of intelligence, 8 of 10 would probably say yes. If you ask two scientists the same question, you just may be opening up a debate that could last for hours. Darwin’s theory bases intelligence on the ability of a species to recognize what it needs to survive, while others believe that the size and architecture of the brain, the capacity to communicate or the ability to solve problems are the indicators. Another reason why the research is limited is that it is complicated and expensive to do it in the wild. Dolphins in captivity may respond differently based on their surroundings and are therefore may not be representative of the wild dolphin. While most of us outside the scientific realm recognize that dolphins are intelligent, we do not know the intricacies of the dolphin’s brain. It has two hemispheres just like the human brain. However, theirs split into four lobes instead of three. The fourth hosts all of the senses, whereas in humans, they are in different parts. Some believe that having all of the senses in one lobe allow dolphins to make quick and often complicated judgments that are well beyond the scope of human ability. When studying the neocortex, which is the outside surface of the brain responsible for perceptions, memories, and thoughts, dolphins have more convolutions than the most intelligent humans. Even more, dolphins may be able to use the hemispheres of their brain separately as they have different blood supplies. Some researchers think that the size and complexity of the brain at birth is a better measure of intelligence. If that statement holds up, however, once more the dolphin comes out on top. The bottlenose dolphin has a brain mass at birth that is 42.5% of the brain mass of an adult. In contrast, human babies at birth have 28% of their adult counterparts. At 18 months, the brain mass of a bottlenose dolphin is 80% of the adults, while humans don’t achieve this level until the age of three or four. While the research certainly makes it look like the dolphin may be the closest to our level of intelligence, it may be quite some time before this can be confirmed. Richard C Connor. Dolphin social intelligence: complex alliance relationships in bottlenose dolphins and a consideration of selective environments for extreme brain size evolution in mammals. 2007. Pilleri G, Gihr M, Purves P.E, Zbinden K, Kraus C 1976 On the behaviour, bioacoustics and functional morphology of the Indus river dolphin (Platanista indi Blyth, 1859). Stephen Leatherwood, Randall R. Reeves. The Bottlenose Dolphin. Elsevier, 2012.